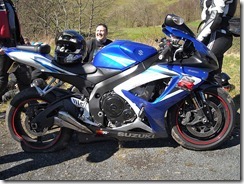 Helen and I went out yesterday with NUKB on a rideout to Blanchland, led by MuddyXR. We left home early at around 8:45am and headed North up the M66/A56 towards Clitheroe. We soon passed by Clitheroe on the A59 heading towards Skipton. Soon after Chatburn we turned left and headed through Sawley to Wigglesworth. In Wigglesworth we turned left and cut through Rathmell to join the A65 at Giggleswick we took to our meeting point at Devil’s Bridge. We arrived at Devil’s Bridge at around 10:00am and had a brew and bacon butty while we waited for the main group to arrive. 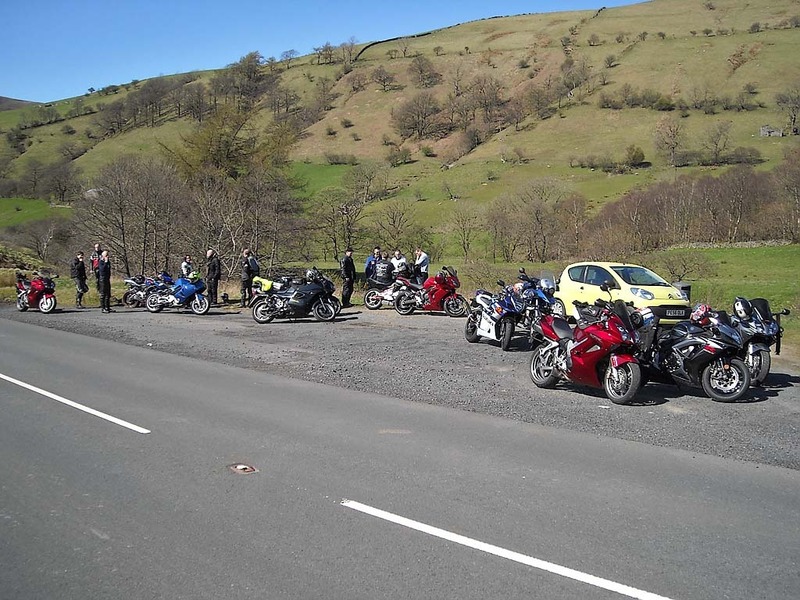 At around 10:45am we all re-grouped and headed North up the A683 towards Sedbergh. 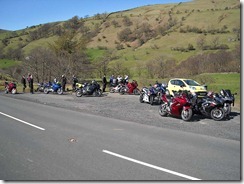 We re-grouped again just outside Sedbergh and then continued on up the A683 heading towards Kirkby Stephen. 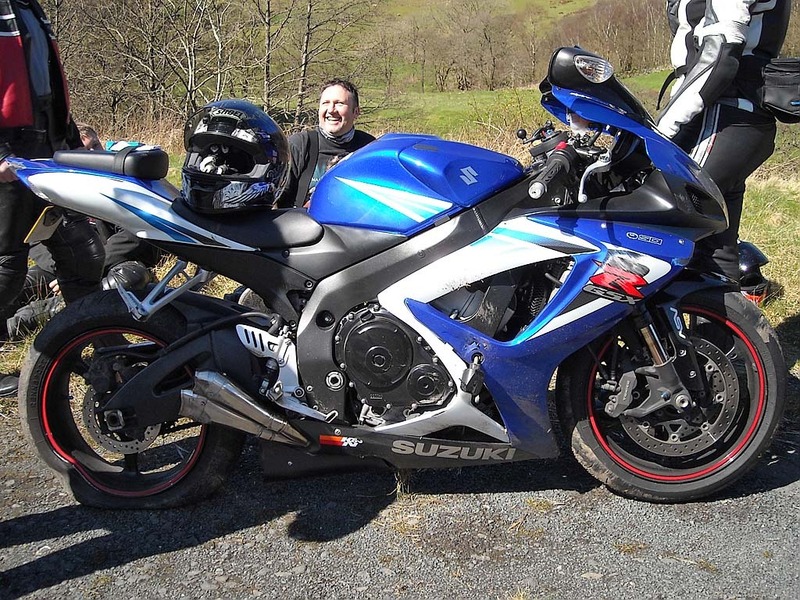 Unfortunately on way up to Kirkby Stephen, Mick came off on a right hander close to Handley’s Bridge. Fortunately he got to his feet straight away only complaining of a damaged ankle. I jumped off my bike and with assistance picked Mick’s bike up out of the middle of the road and parked it up safely. After sorting Mick out I headed off up the road to collect the guys who were ahead of Mick at the time to bring them back. When we arrived back everyone had parked a bit further up the road in a convenient lay-by. On close inspection Mick’s bike had a buckled rear wheel and flat tyre and was no longer ride-able. After a few phone calls it was decided that the main group would continue on and Beamerbiker and Grimster would stay with Mick until recovery arrived. I have since found out that Mick has been to hospital today and had his leg/ankle put in plaster. We all re-grouped and set off up the A683 to Kirkby Stephen. After a brief fuel stop in Kirkby Stephen we continued on up the A685 to Brough. In Brough we took the glorious and quiet B6276 to Middleton-in Teesdale via Lune Moor. We skirted around Middleton and joined the B6278 at Egglestone and continued North towards Stanhope. We soon arrived in Stanhope after a good run over Bollihope Common. We worked our way through Stanhope after dropping down off the common via the hairpins and continued North on the B6278. Shortly afterwards we turned left and headed for Blanchland via Edmondbyers Common. We arrived in Blanchland at around 1:45pm and while looking for somewhere to park came across CJ and Ella in the car. At around 3:00pm after lunch we all re-grouped and headed East on the B6306 towards Consett. Just before Consett we joined the A68 and headed South towards West Auckland. In West Auckland we turned right and took the A688 towards Staindrop. After passing by Raby Castle on our right we joined the B6274 and headed towards Richmond. In Richmond we took the A6108 to Leyburn. We then stopped in Leyburn for a short while to take on board the customary NUKB ice creams. We all re-grouped and headed down the A684 towards Aysgarth, were we joined the B6160. We took the B6160 towards Threshfield via Kettlewell. We stopped in Threshfield for a brief break then headed on the B6265 towards Skipton. Just outside Skipton we joined the A59 and headed towards Preston. The group started to break up at this point as everyone headed off home. Helen and I turned off the A59 and took the A56 via Earby to Colne. We then jumped on the M65 and headed home.